supportING Tibetan refugee children in India. Thousands of refugee children from Tibet live in Tibetan Children's Villages throughout India. Many of them walked over the Himalayan Mountains to get there. 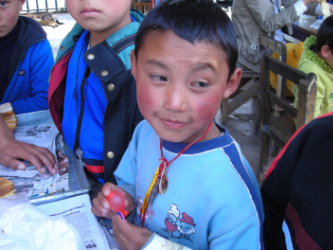 These Tibetan children have lost their country, homes, and in many cases, their families. The purpose of this non-profit foundation is to provide care and support for these children. One hundred percent of all contributions go directly to purchase shoes and mattresses. No administrative costs are covered by the foundation. Foundation Director Nancy Corliss has traveled 12 times over the past six years to the Tibetan Children's Village (TCV) in Dharamsala, India, where she works in the Junior Library, and has developed numerous projects, including the purchase of shoes and mattresses, to help the children. Each time Nancy visits, she stays from 6 - 10 weeks. She personally pays for 100% of travel, office, and other administrative expenses connected to this work. "I see this work as not only providing needed items like shoes and replacements for the current, very old, mattresses of burlap stuffed with coconut fiber, but also as a bridge for awareness, communication and education," says Nancy. Lisa Coutu, Ruth Fish, and Kendra Schieber serve on the executive board of the foundation, and are assisted by consultant Tim Shuler. As time has passed the number of people involved continues to grow. Many have become sponsors of children or have provided funds toward the purchase of shoes and mattresses. Others have become pen pals. Two women knit for TCV, others provide coats, clothes, books, bookmarks, matchbox cars, marbles, and other small items.